The battle over the moons in and around the Heimatar regions continues unabated as Siege Green. forces reinforced a Did he say Jump [JMP-N] tower in Gukarla. With its invulnerability phase set to expire in the early hours of the 9th of April, Siege Green. and allies gathered a 90 pilot Machariel battleship fleet including several combat carrier squadrons. The fleet itself relied on force auxiliaries for its logistics wing. In order to defend the tower, Shadow Cartel and Did he say Jump assembled a 120 pilot Proteus strategic cruiser fleet. Almost 3 squadrons in the fleet were taken by dreadnoughts which were held in reserve. The two respective fleets bridged into the system nearly at the same time. Siege Green. chose to light its beacon near the tower in question while Shadow Cartel preferred one of the stations instead. The two fleets brought only the sub capital portion of their fleets through, force auxiliaries not counted. Siege Green. set up near the tower when Shadow Cartel warped in and landed a hundred kilometers away. The two sides opened fire. The Proteus fleet hovered between long and medium range, firing at the ranks of the battleships. The Battleships themselves couldn’t respond as they were fitted for a close range engagement, bristling with autocannons. The battleships unable to project their power were forced to quickly hold fire and wait for their combat timers to run out so as to re-fit artillery cannons instead. Even though given free reign to engage, the Proteus fleet was unable to break through the enormous armor buffer of the battleships. Switching around, all the strategic cruiser fleet could do was clear support and light tackle from the field while making no progress. The battleships themselves managed to fit their artillery cannons and started bombarding the strategic cruisers which held well under the barrage. A stalemate had been reached early on in the battle. After a futile few minutes of meaningless exchanges of munitions, Siege Green. sought to escalate matters. Unable to put a dent in the impressive armor of the strategic cruisers, Siege Green. sought to target the logistics wing of the Proteus fleet which remained so far at the edge of Machariels’ range. Bringing in a squadron of combat carrier, Siege Green. put all its firepower on the Guardian logistics cruisers of Shadow Cartel. The ships soon came under heavy fire as swarms of fighters and artillery shells descended upon them. Shadow Cartel reacted to the new threat and targeted the fighter squadrons. The fighter horde came under heavy fire from the strategic cruisers, annihilating many of the squadrons fielded by the combat carriers. Siege Green. kept pumping out new fighter squadrons to replace the losses, directing them at the helpless logistics ships. Slowly, Guardian after Guardian caved in to the coordinated assault. At that point, Shadow Cartel decided to retreat to a perch on the grid. Considering its options and learning of a Triumvirate. [TRI] reinforcement fleet heading their way, the Shadow Cartel fleet commanders decided to continue the fight. Strategic cruisers were told to switch to short range, high damage ammunition and the fleet aligned towards the waiting battleships. The fleet warped in, landing near the battleships and the combat carriers and started to brawl with the attackers. Siege Green. did not balk and met Shadow Cartel head on. The strategic cruisers managed to blast their way through several battleships, catching their pilots off guard. Siege Green. retaliated and took down more Guardians and even strategic cruisers. The two fleets circled each other, exchanging blows at short range with losses mounting for both sides. Triumvirate. arrived on the field a few minutes later. The alliance had brought a 60 pilot Tengu strategic cruiser fleet. The Tengu fleet landed at medium range of the fight and supplied cover for the Proteus fleet, targeting the Siege Green. fighter swarm. Railgun batteries fired constantly at the swarm of fighters, felling more and more. Several combat carriers had lost all of their fighters, finding their hangars devoid of replacements. This forced Siege Green. to rotate its carrier squadrons, jumping out empty carriers and bringing in fresh ones. With Triumvirate. on the field, Shadow Cartel decided to escalate once more. One of the strategic cruisers lit a cynosural beacon and into the field materialized the entire dreadnought force of the fleet. The dreadnoughts wasted no time, entering siege cycles and blasting at the hostile capital ships. Force auxiliaries, combat carriers and even hostile dreadnoughts were destroyed rapidly as the three dreadnought squadrons overwhelmed their opposition. Siege Green. targeted the hostile dreadnoughts, destroying a few in the ensuing exchange but losing much more in the process. Outnumbered, outgunned and with many of its combat carriers neutered by the strategic cruisers, it was time for Siege Green. to cut its losses. The order to retreat was sounded and the remaining capital ships attempted to withdraw, either jumping out or warping off the field to dock up in stations. The Siege Green. Machariel fleet aligned out and warped off, leaving only a few stragglers behind to be dispatched by Shadow Cartel and its allies. Shadow Cartel for its part attempted to hold down as many of the retreating enemies as it could, destroying them with ease. Finally the grid had been cleared of hostiles, leaving Shadow Cartel and its allies in control. With the tower secured Shadow Cartel looted the grid, salvaging what it could while extracting its capital ships. Once its heavy assets were safe, both strategic cruiser fleets departed the system, bringing an end to the fighting. Battle report for the Gukarla system can be found here. All told the battle lasted 57 minutes with Time Dilation not reported and the system hosting 262 pilots at the height of the fighting. Siege Green. 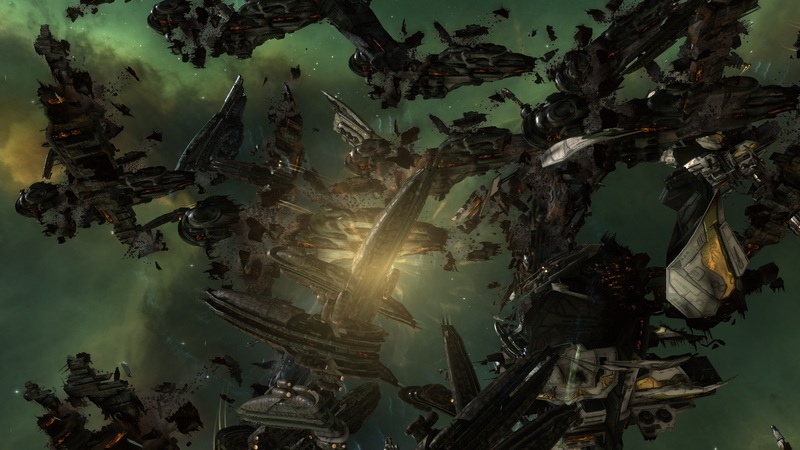 and allies lost a total of 70 ships in the battle, including 3 dreadnoughts, 6 force auxiliaries, 13 combat carriers and 16 battleships for a total of 63.83 billion ISK damage. Shadow Cartel and its allies lost 20 ships, including 4 dreadnoughts and 7 strategic cruisers for a total of 19.06 billion ISK damage. I simply want to tell you that I am just newbie to weblog and certainly savored you’re blog site. Almost certainly I’m likely to bookmark your site . You amazingly have fabulous posts. Thanks a lot for revealing your web page. I want to blog concerning problems I do not want relating to my ‘job’ self. Just how do I pick a blog host that has an excellent anonymity document, simply put, I don’t desire it to be very easy for people to pair up my IP address or gain access to my personal details. Additionally, having established the blog site up, just how do you encourage high quantity site visitors?. I’ve just used LJ before and also I wish to attempt something a bit different, however privacy is the greatest concern for me. Would welcome ideas of good cost-free blog site hosts.